Note: This is the first installment of the Series “Roadtripping With a Raindrop,” highlighting moments from my travels along the Mississippi River, right through the heart of America. 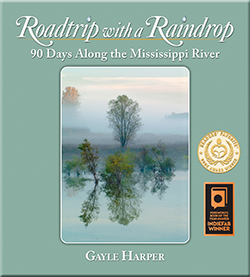 Many of these are from the “raindrop journey,” a 90-day road trip keeping pace with a raindrop as it traverses the nearly 2,500 miles of Mississippi River from the headwaters in Minnesota to the Gulf of Mexico. Some will be included in the upcoming book of tales and photographs from that adventure and some will only be shared right here. I’ll introduce you to some of the amazing people I met, take you inside some unique cultures and lifestyles and share some crazy, serendipitous adventures as well as some of the life lessons that the River offers. Don’t miss a single Moment – If you haven’t already done so, you can sign up to be notified when a new post appears in the box below. Off we go!